Who's He? the Doctor Who podcast from a triumvirate of unlikely fellows who give you news, reviews, discussion and audio commentaries of old and new Who. Sometimes they get it right but mostly they take the word ramshackle to new heights! The Macra Terror gets its DVD and Blu Ray release (and Paul admonishes Phil for not getting him a free copy), there's Big Finish new release news, Jodie Whittaker is awarded the freedom of the City of London and John Levene releases his autobiography. It's the 1974 and glam rock is at its height and there is an alien invasion by way of a Stylophone for the Doctor and Lucie Miller to fight! Yes, this month Phil and Paul look at The Horror of Glam Rock from Big Finish that also stars the mighty Bernard Cribbins! But Paul is perturbed at roadies drinking coffee and Phil is embarrassed to admit that he once owned a Stylophone. But did they like this audio story? Listen to find out! This episode Phil talks to Bob Fleming from the Progtor Who and The Discovery Log podcast about his favourite Doctor Who companion K9. During this conversation on the Doctors erm.. 4 legged friend, it slowly dawns on Bob that he really loves John Leeson and it also gives Phil another chance to get wound up at Brendan from K9 and Co.
Be warned, this podcast contains strong language! We say goodbye to Graeme Curry, the writer of The Happiness Patrol, the rerelease of a BBC Radiophonic Workshop classic, Rosa wins an award and there is gaming news Doctor Who: The Runaway a new virtual reality game and Doctor Who: Legacy is no more! Phil and Paul take a look at this Target novelisation written by Terrance Dicks. Otherwise known as Spearhead From Space, this is the story that introduces the Third Doctor, Liz Shaw and the Doctor exiled to Earth. How does this book compare to the televised version and why does Paul get confused with an army General and a cartoon dog? This episode Phil talks to Martyn Havell from the Bad Wilf podcast about his favourite Doctor Who companion, Martha Jones. Martyn describes why he thinks Martha is an important character and also why the character was given a hard a time by fans. Also listen out for Phil and Martyn to go off topic when the conversation turns towards Mrs. Browns Boys! In this short edition of the Who's He? Podcast, Phil reviews (in a non spoiler way of course!) the Doctor Who novel Scratchman written by Tom Baker with James Goss. We say goodbye to Clive Swift and W. Morgan Sheppard, David Tennant starts his own podcast, the War Master returns for Big Finish, The Daleks Master Plan is coming to vinyl and Resurrection of the Daleks and Revelation of the Daleks will be making their Target debut. They never thought they would return to the corner this year but they have the final consolidated ratings for Resolution and news on where Doctor Who came in the iPlayer Top 10 for 2018. There are some more B&M exclusives with a regenerated 4th Doctor and TARDIS set and a 13th Doctor and TARDIS set from Titan. The lads finally tackle Boom Town in their series 1 retrospective (which seems to lasting an eternity) and while they enjoy it, there are some reservations with Rose and Mickey's relationship but are pleased at the lack of farting! In this, the first podcast of 2019, Phil and Paul tackle this years (or last years if you're Phil) New Years Day special, Resolution. And of course the worlds worst kept secret came true as we saw the return of the Daleks! But was everyone happy with this special? Was it indeed a special or the actual last episode of series 11? Listen find out what the lads thought and of course what our listeners thought in our listener feedback section. In the news, we say goodbye to June Whitfield and Bill Sellars, there is missing episode audio news, Omega's Stats Corner and finally some news about the Who's He? Podcast! These are going to be bigger than the Daleks! In the last video podcast of 2018, Phil takes a look at the effects of not falling back on tried and tested monsters and aliens to launch a new Doctor to the waiting world and past attempts at finding that monster that is just as good as the Daleks. This is it folks, the finale of Jodie Whittaker's inaugural season of Doctor Who, The Battle of Ranskoor Av Kolos. This is also the return of Chris Chibnall on writing duties and also his first season finale as show runner, so how does he hold up? Is the usual universe threatening extravaganza we're all come to expect or this is a quieter affair? Well, Phil and Paul provide their thoughts on this story and also how they found the series overall. Also included this week is a special feature in which Phil reviews The Doctors: Villains! DVD. And in the news, there will be no series in 2019, the Macra Terror has go the animated treatment, pointless awards news and of course Omega's Stats Corner. We would like to wish all of our listeners a very Merry Christmas and a Happy New Year! A creepy house in a Norwegian wood? A monster lurking in the undergrowth? Well, not exactly as It Takes You Away, the penultimate story of this season of Doctor takes you away to a lonely universe populated with a character from Babylon 5 and Hypnotoad! But it certainly made for an interesting episode of Doctor Who with Sapphire and Steel undertones! And in the news this week, we say goodbye to Andrew Burt, more Tom Baker blu-ray news and of course there is Omega's Stats Corner! Running away from angry villagers wielding pitchforks and flaming torches, Phil and Paul bravely avoid the ducking stool to bring you their review of The Witchfinders, the latest episode of Doctor Who. This week Phil and Paul are in two minds over this historical romp as this was a particularly grim time in British history and does this story do it justice? And in this news this week there are returning Doctor Who characters to Big Finish, Tom Baker releases the long gestating Scratchman in book form, we say farewell to British character actor George A. Cooper and of course it's Omega's Stats Corner. Kerblam! Yes, I can't believe that's the title of this weeks episode of Doctor Who for Phil and Paul to take delivery of. But take delivery they do and in this satire of a well known online store and it's ethics, both of our reviewing duo feel a bit non plussed but kind of enjoyed it at the same time. Does that make a good episode though? Listen to find out! And in a slow news week, the lads indulge in rumours with stories of series 12 of Doctor Who apparently confirmed by the BBC for 2019 but also paired with rumours of a shorter series and Chibnall and Whittaker leaving! After last weeks divisive episode of Doctor Who, this week the lads take a look at Demons of the Punjab by Vinay Patel. In this non-Chibnall written story, has this got this series of Doctor Who back on track as far as Phil and Paul are concerned? And does this tale set during the partition of India in 1947 make Doctor Who too political and PC as some quarters are trying to suggest? Listen to find out what they thought! And in the news, Barrowman is going to enter the jungle, the Doctor Who Experience is making a comeback, there are the dreaded stats and in Omega's Tat Corner there is a 13th Doctor 5.5 inch figure heading our way and there is festive tat! Oh dear. In this weeks show a downcast Phil and Paul get puzzled by The Tsuranga Conundrum written by Chris Chibnall. After last weeks middling story, the lads were hoping things were going to pick up again but what did we get? A story that appears to have split opinion and has lead fans calling for Chibnall's head! But do Phil and Paul agree? Listen to find out what they thought and also what the listeners thought in the listener feedback section! And in the news, we're getting a New Year special rather than a Christmas special this year, the Paternoster Gang return to Big Finish and of course Omega's Stat's Corner. Argh! Spiders! Yes, this week Phil and not so much Paul sit on their chairs with their feet up off the floor in terror to look at episode 4 of Doctor Who, Arachnids in the UK. So after 3 pretty solid episodes, does this story make it 4 out of 4 for our reviewing duo or does it get flushed down the sink like all spiders should (according to Phil that is)? And in the news this week we say goodbye to ex Doctor Who producer Derrick Sherwin, there's stats in Omega's Stats Corner and there is tat of the sweetie kind in Omega's Tat Corner that causes Phil and Paul to become confused. In this special and fairly Doctor Who free edition of the Who's He? Podcast, Phil interviews actor, writer, comedian and of course podcaster Toby Hadoke about his upcoming adaptation of Nigel Kneales The Road for BBC Radio 4. Also, Toby talks about his commentaries for the blu-ray release of Quatermass and the Pit and also his recent play for BBC Radio 3 Going, Going Goon celebrating the centenary of comedian (and Phil's hero) Spike Milligan. You can hear The Road on BBC Radio 4 on Saturday 27th October at 14:30. The Quatermass and the Pit blu-ray is released on 5th November. Going, Going Goon can be heard on the BBC Radio iPlayer. In this weeks show, Phil and Paul turn their attention to one of the most important episodes of Doctor Who - Rosa written by Malorie Blackman and Chris Chibnall. In this historical story of an event that started the civil rights movement in the USA, what does this story teach us of how we treat fellow human beings and is it still relevant today? And in the news this week, we see the return of some beloved characters to Big Finish and of course there is Omega's Stats and Tat Corners! In this weeks show, we bring you more stats and tat in Omega's Stats and Tat Corner and also an update on the William Hartnell blue plaque that received its grand unveiling. And then it's down to business as Phil and Paul tackle the latest episode of Doctor Who, The Ghost Monument written by Chris Chibnall. So does this story suffer from that familiar 2nd episode syndrome and what about the new TARDIS interior, hit or miss? Listen to find out what the lads thought and of course what our listeners thought in a bumper edition of listener feedback! Doctor Who is back with the very highly anticipated debut of Jodie Whittaker as the 13th Doctor in The Woman Who Fell to Earth! So after all the months of waiting, does this latest Doctor surpass all expectations or was it just like all the naysayers were predicting? And how does Chris Chibnall make his mark on the series? Phil and Paul talk about this and much more in the bumper edition of the podcast! Not only that however, we have listener feedback, Omega's Tat Corner and an unwelcome bout of the of the dreaded stats in Omega's Stats Corner! In this weeks episode it's all go as since the lads have been away, we have had a new trailer for series 11 and a confirmed air date of Sunday 7th October for Jodie Whittaker's debut as the Doctor! So Paul and Phil are quite excited about this but this wouldn't be the Who's He? Podcast without Phil voicing some concerns! But this main reason for the pair of them getting back together after an extended break, is to talk about the Target novelisation of The Enemy of The World by Ian Marter which the pair of them seem slightly disappointed about. Listen to find out why! Also included this week, we lost three more people connected to Doctor Who, Missy is going to Big Finish, Paul shows off his rampant sexism and disdain for the working classes and of course, Omega's Tat Corner! On this weeks podcast, Phil and Paul travel back once again to wartime London with a look at The Doctor Dances. This is pretty much a love in as our reviewing pair heap on the praise for this Steven Moffat story and really cannot find anything negative to say about it! But in the news this week, it's a sad time as we lost both actress Jaqueline Pearce and Production Designer Michael Pickwoad which has shocked and saddened in equal measure. Also in the news, Big Finish has announced how it will be celebrating its 20th anniversary next year and will series 11 start in September or October? In this edition of the Who's He? Video Podcast, we bring you long forgotten footage of deceased monster actor Hamilton Prickwillow from 1978. This week Phil and Paul tackle Nekromanteia from Big Finish. And oh dear, what a mistake they made by selecting this one! With a story that has some very suspect portrayals of women that that basically concludes with 'don't trust a woman', neither Paul nor Phil hold back with their views on this very disappointing story that contains far too many characters and double crosses and annoying cackling witches! And in the news this week, we say goodbye to Alan Bennion, filming has wrapped on series 11 of Doctor Who, news that a Doctor Who Children in Need special is being filmed, Big Finish are reuniting Tom Baker, Lalla Ward, John Leeson and Matthew Waterhouse in a new series of 4th Doctor adventures and the DWAS are funding a blue heritage plaque for William Hartnell. This week the lads return to the era of the 9th Doctor and The Empty Child written by Steven Moffat. In this story of ghostly gas mask wearing children in the London Blitz of 1941, there is much still enjoy since this was first aired in 2005, with the writer, director and actors all on top form but somehow the conversation turns to the state of Phil's bottom. Listen to find out how that happened! And in the news it's San Diego Comic Con all the way with a new series 11 trailer, Chris Chibnall sets out what we can expect in series 11 and there is loads of new tat for Omega's Tat Corner! In this episode recorded on a very hot Sunday afternoon in London, Phil and Paul decide to read The Edge of Destruction and discuss its merits with Betty Swollocks. While the televised version is not well regarded and dismissed as a time filler with a weak resolution, Phil and Paul defend this story and highlight just how much the book improves on the concept. And in the news this episode, the BBC seek legal action over the leaked clip of series 11, we could be getting a series 11 trailer this week, the chances of an episode of Doctor Who on Christmas Day may have increased, we say goodbye to Helen Griffin and in Omega's Tat Corner the BBC have opened an Aladdins Cave of tat! In this episode, Phil and Paul grab some forged passports and tunnel their way out their cells to review Colditz by Big Finish. In this 7th Doctor and Ace story that features a future Doctor and introduces the character of Dr. Elizabeth Klein, the reviewing duo (well, Phil really) go off track with discussions on World War 2 themed toys of their youth, how warnings from history are being ignored or airbrushed from existence and how just how dangerously close we are to repeating the same mistakes that 1930's era Germany made. Oh, and they talk about the story itself of course! And in the news, the new Doctor Who cast will appear at this years Comic Con in San Diego and we say goodbye to British soap legend Leslie Grantham. And in a little bonus, the lads talk about their trip to the BFI to see the UK premiere of the blu-ray edition of Genesis of The Daleks! Once again Phil and Paul dip their toes into the waters of the Eccleston era with a look at Father's Day written by Paul Cornell. As neither of our reviewing duo had really watched this episode since broadcast, do they think this story adds to the Doctor Who family or does it raise some series Daddy issues? Listen to find out! And in the news, classic Doctor Who on Twitch is all the rage while modern Who is alive again on the BBC iPlayer, BBC Maida Vale studios are to close and in rumour news a series 11 trailer to air after Englands first game in the World Cup? This week Phil and Paul travel back to Tudor times with The Marian Conspiracy from Big Finish. And while it has taken them a month later than planned to chat about this story, they both tackle this with their usual fervour and are both full of praise. Yes, praise!! Maybe the break did them good? And in the news, there is list of of series 11 directors to talk about and in a lengthy Omega's Tat Corner, it's Dave Hill from Slade and a new range of 5.5 inch figures! In this episode, Phil takes a quick look at forgotten director Wainscutting Mimsy and his troubled association with Doctor Who. Bonus Episode - To podcast or not to podcast? In this bonus episode of the Who's He? Podcast, Phil drags James Rockliffe from the Doctor Who Podcast out of podcasting retirement to discuss podcasting and Doctor Who fandom. Is podcasting still necessary for Doctor Who fandom and is there a future for it? What shape shall podcasting take and what do people do it for? For fun, a career or just downloads? Listen in to find out! In this episode of the Who's He? Podcast, it's a very Christopher Eccleston themed edition where we look at The Long Game in our ongoing series 1 retrospective. But not only that it's Eccleston all the way in this weeks news also, with more on why he left Doctor Who and also his upcoming appearance at this years London Film Comic Con. But in our review of The Long Game, the lads focus on the power house companion Adam and just how little he brings to the table. This week, Phil and Paul plunge into the depths of the murky waters of Target and come bobbing up to the surface with a look at the novelisation of The Sea Devils by Malcom Hulke. And in a surprising turn of events, our intrepid duo don't agree on this book. But which one thought it was a majestic blue whale of a book and which one thought it was a wet haddock? Tune in to find out! And in the news, we say goodbye to Ken Dodd, Dorka Nieradzik and Peter Miles, Christopher Eccleston opens up and what happened between him and the BBC after he left Doctor Who and in a welcome return to Omega's Tat Corner, it's handbag tat! This week, Phil and Paul listen to another audio story from Big Finish and this time it's Creatures of Beauty starring Peter Davison and Sarah Sutton. Of course this being a Big Finish review, there will be spoilers a plenty but this time our reviewing duo had a tough time not giving away the plot of this non-linear tale of pollution and genocide, so settle back and listen to two bewildered Doctor Who fans and their stream of consciousness! And in the news this week, it's plenty of series 11 news with a new logo and when the series will air, Murray Gold and Jamie Mathieson confirm they are not returning to Doctor Who and there is also news of some new Target novelisations! Fresh from his trip to the Gallifrey One convention in LA, Phil brings back a little pressie in the form of an audio commentary for Planet of Fire. In this latest edition of the Who's He? Video Podcast, Phil takes a look at how extras and actors have dominated scenes in Doctor Who with their special brand of ACTING!! Once again Phil and Paul return to the Christopher Eccleston era with Dalek in their never ending series 1 retrospective. Regarded as a modern classic of Doctor Who, how does this story of a lone Dalek hold up after 12 years? Listen as our intrepid duo discuss what they felt about this story on first watch in 2005 and how the little nod of continuity in this episode moulded Doctor Who of now. And in the news, a competition on BBC Radio 1 to be at the premier of the 13th Doctors first story, DVD news from the Myth Makers team, we say goodbye to the mighty Peter Wyngarde and Jeremy Wilkin and in Omega's Tat Corner, some late festive tat! In the first podcast of 2018, Phil and Paul turn their attentions to the written word with the Target novelisation of Genesis of the Daleks by Terrance Dicks. In this classic story of the Daleks creation, the lads find much to enjoy but does the fact the TV story is so iconic, it ruins this book? While the pair of them to try to wrestle with this weighty topic, Paul takes it upon himself to ruin this classic story for everyone! And in the news this week, a few morsels of information for series 11, a narrowly avoided legal dispute involving the name Lethbridge-Stewart, we say goodbye to David Fisher and Bella Emberg and to round things off, an unwelcome trip to Omega's Stats Corner! This is it everyone! We finally say goodbye to Peter Capaldi and hello to Jodie Whittaker in Twice Upon a Time, this years Doctor Who Christmas Special. But did Phil and Paul find this to be special or were they overcome with a case of Christmas humbug and why does Phil feel particuarly troubled at the how the 1st Doctor was written? 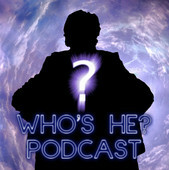 Well, there is only one way to find out and that's to listen to this latest episode of the Who's He? Podcast! And if you haven't watched it yet, there will be spoilers abound! And instead of the news, we have stats in the unwelcome return of Omega's Stats Corner! And lastly we just want to wish all our listeners a very Happy New Year and we will see you in 2018! Jingle bells, Batman smells, Robin laid an egg! Yes, it's nearly Christmas so that means it's time for the Who's He? Podcast Christmas Special! So sit back and relax and listen as Phil, Paul and Tony mutter their way through K9 and Company in a festive audio commentary! Amongst the devil worship and sacrifice and an entire village getting drunk and smoking themselves to death, our intrepid trio hold up in the face of adversity (with the help of good old fashioned booze!) and bravely try to be informative with what was on telly and what was the Christmas number 1 on 28th December 1981. Incidentally, a happy Christmas to all of you at home! The kid stays in the picture! In this edition of the Who's He? Video Podcast, Phil presents his top 5 examples of stunt casting in Doctor Who. In an episode that Phil and Paul have been dreading, they are forcibly sat down and made to watch World War Three in their continuing series 1 retrospective. With badly acted news reporters, Mickey's chip shop condiments and the ridiculous Slitheen, the pair of them try their damnedest to find some good in this story! And in the news, screenings of the Christmas special are to occur in Canada and the North of England, Shada DVD news, we say goodbye to Keith Baron and Rodney Bewes and in Omega's Tat Corner there is an item of tat that you can pull nice and tight around your neck! In this episode, Paul and Phil scrape the bottom of the Doctor Who barrel and decided to tackle the Target novelisation of Time Flight, written by Peter Grimwade. And do you think the book will be any better than the televised version? Do you think the book will address the racist caricatures that were present in the TV serial? Do you think the book will.....oh don't bother! Just listen to be disappointed, as if you were expecting anything else? And in the news this week, we say goodbye to three Doctor Who alumni, Jodie Whittaker's 13th Doctor Costume is revealed, there are some NuWHo Target books on the way and in a return to Omega's Tat Corner, there is some quality timekeeping tat! A wet and soggy Phil and Paul (recently released from prison) come up for air and review Prisoners of the Lake from Big Finish, the first in their Third Doctor Adventures series. Both of our intrepid reviewers find themselves transported back to Saturdays nights in the 1970's in a story that could only be written for the third Doctor and Jon Pertwee but did Tim Treloar manage to recreate that Pertwee magic? And in the news, the pair of them catch up with recent events with the casting and director news for Series 11, a River Song Big Finish update and Shada being shown in Australian cinemas. In this episode Phil is joined by the wonderful Erika Ensign from the Verity Podcast. And in the wake of Class being cancelled recently, they decided to sit down and chat about the various Doctor Who spin offs that have been made for TV starting with K9 and Company and right up to date with the aforementioned Class and also just how the TV stations in their respective countries treated some of these series. It might not be as different as you think! In this edition of the Who's He? Podcast, we have our third and final interview recorded at the Whooverville 9 convention in September. This time, we chat to the wonderful Wendy Padbury about her life and career and she reveals her unhappy experience working on a classic British horror film. Phil and Paul return once again to the past with their series 1 retrospective with a look at Aliens of London by Russell T. Davies. In this tale of alien invasion and copious amounts of farting, how does this story hold up now? Well, Phil thought time was kinder to it then he remembered but Paul, well, he's not a fan of soap operas it seems! Also, we have an interview with Hayden Gribble from the Diddly Dum Podcast who talks about his new book Child Out of Time: Growing Up With Doctor Who in The Wilderness Years. And in the news, Shada is getting the animated treatment and we say goodbye to Trevor Martin. Find information on Hayden's book here.